I previously posted several photos of a California ground squirrel (Otospermophilus beecheyi) interacting with one of our ground-based remote cameras. 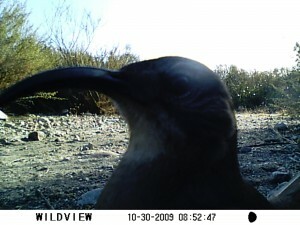 The two photos below show a California thrasher (Toxostoma redivivum) exhibiting the same curiosity. Perhaps it is the shape of the camera or minor light reflection off the lens glass (actually plastic). 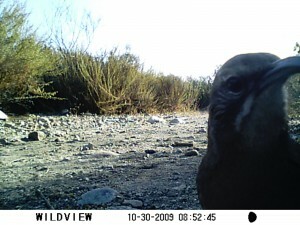 The “Wildview” cameras are silent during operation and do not flash during the daylight hours. The video shows two raccoons (Procyon lotor) on one of the islands of Phlake also interacting with the camera. The model is the Cuddeback “No Flash”, which takes a single still frame shot followed by a video capture. At night, the camera’s infrared “flash” is operational. The flash window is approximately 3 inches long by 1.5 inches high and consists of an array of red LED’s. When taking a video the array flashes rapidly, perhaps one flash per “frame” taken. While this is far less shocking than a typical photo flash, it is noticeable. The raccoons are clearly interested, maybe even a bit perturbed by it. Stick with the entire 45 seconds as the first raccoon approaches the camera, goes behind it, jostles it and comes back around, moving on to business. Another comes over the top and seems to be surprised by the flashing array. To us, the array flashes red, what the raccoons see may be just a pulsing white light. Raccoons have excellent night vision, but have no color capability (monochromatic). You can view the video embeds in full screen by clicking on the icon on the bottom of the screen, second from the right.